The first floor exhibition at the Grosvenor Centre (pictured) will be free of charge. 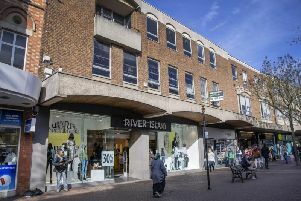 A collection of gruesome, historical and hysterical stories of the town's past will be on display this summer when ‘Nasty Northampton’ opens in the Grosvenor Centre. This blockbuster kids’ exhibition, created by Northampton Museums and Art Gallery, takes a sideways look at tales of swashbuckling robbers, hair raising highwaymen and lethal leprosy. There will be appearances from some of the famous characters connected with Northampton, including Francis Crick, who discovered DNA, and the Archbishop of Canterbury Saint Thomas Becket, who was tried for treason at Northampton Castle in 1164. Visitors can also discover why Francis Tresham’s head was displayed in Northampton, dress up as a historical character or take a turn in the stocks. Councillor Anna King, Cabinet member for community engagement and safety, said: “I am sure that both children and adults will enjoy this light-hearted and entertaining exhibition, which is part of the museum’s wider summer programme. 'Nasty Northampton' is located on the upper level of the Grosvenor Centre, by Costa Coffee, and runs from Saturday, 21 July until Saturday, 15 September. It is open from Wednesday to Saturday, between 12pm and 5pm. Admission is free.